One of the greatest honors of my blogging career has been my involvement in T.O.F.U. Magazine. I’m amazed every time, that Ryan Patey, Editor-in-Chief, even gives my writing a passing glance much less publishes me! 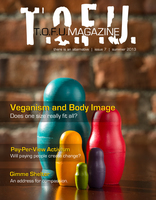 Download the issues of T.O.F.U. All the articles and features in the magazine are well written, informative, and always leave me thinking I could write so much better. 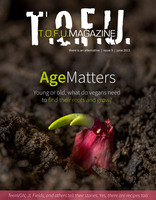 Please download the issues and enjoy some vegan reads!